Since October of last year, the board of the Community Store of Saranac Lake has been considering the former Corvo’s Restaurant as a possible site for the Store. This winter there was an open house at the site, so that members of the community could tour the space and make product suggestions. The board also began interviews for key positions. Today, The Interim Board of Directors of the Saranac Lake Community Store is pleased to announce that it has reached the $500,000 threshold necessary to commence operations. In practical terms, this means that funds invested to date can now be released from escrow allowing the company to enter into commitments and move forward with preparations for opening its doors during the coming summer. Those interested in investing in this unique community-based venture can still do so — the public offering* remains open until June 22, 2011 and share subscriptions can be accepted up to $600,000, allowing for increased operational flexibility. Said Melinda Little, President, “this is the result of many years of hard work by a dedicated group with the support of this incredible community. We offer our deep appreciation to all those who have shown their faith in this concept by investing. Attaining this milestone allows us to hit the ground running as we move ahead to secure the property, make the necessary renovations and hire key staff.” Preparations have been underway for some time on all these fronts in anticipation of achieving this level of equity capital. “Now the real work begins!”, added Little. Alan Brown, Treasurer observed, “with over 600 investors averaging about $800 each, this is a truly grass-roots venture.” Investors include permanent residents of the Tri-lakes region, seasonal residents and others with an affinity for the area and who feel inspired by the self-reliant spirit that gave rise to this project. “I feel privileged to be a part of a community that can raise this amount of capital, particularly in the face of these difficult economic times”, said Brown. Lease negotiations are underway with Greg Moore, owner of the former Corvo’s restaurant building and bids will be sought from local contractors for the necessary renovations and alterations in conjunction with Mr. Moore. In addition, organizers have been interviewing candidates for the key staff positions of Manager and Assistant Manager and it is expected that employment offers will be made soon. 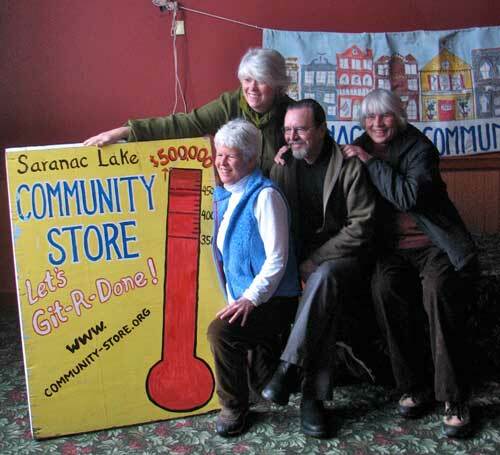 The Saranac Lake Community Store is raising capital* to open a community-owned retail department store that will enhance the sustainability and self-sufficiency of the retail economy in the Tri-Lakes by providing a range of reasonably-priced goods not readily available in the locality. Product ideas should be mailed to Melinda@community-store.org.